How to Shoot the Moon! Imagine, if you will, how you feel when you are outside in the dark and someone shines a bright flashlight in your face. Your pupils are wide open and the light hurts your eyes, making you look away. Well, your camera feels the same and it tells you with overexposed moon images. Your camera sees the moon as a bright light shining in its eye (lens) and hopes you will close its pupil (aperture) down so that it won’t hurt (blow out the detail). Remember, when shooting the moon, you should protect your poor camera from moon blindness by using a small aperture! Set the shutter speed to 1/125 sec, aperture to f/16, and ISO to 100. Take a picture. If the moon is too dark, open the aperture to f/11. If still too dark, open to f/8. This sounds counterintuitive since it is nighttime. However, if you let the camera choose—using one of its auto modes [instead of Manual (M) mode]—all that blackness surrounding the moon will fool the light meter into overexposing the moon. Most nighttime photography (e.g., star field) is best done in Manual (M) mode so that you can carefully control the exposure. Just think of the moon as a tiny copy of the sun and you will do much better. There’s a LOT of light coming from a full moon. The moon is small, forcing you to crop the image to make it large enough to be impressive. 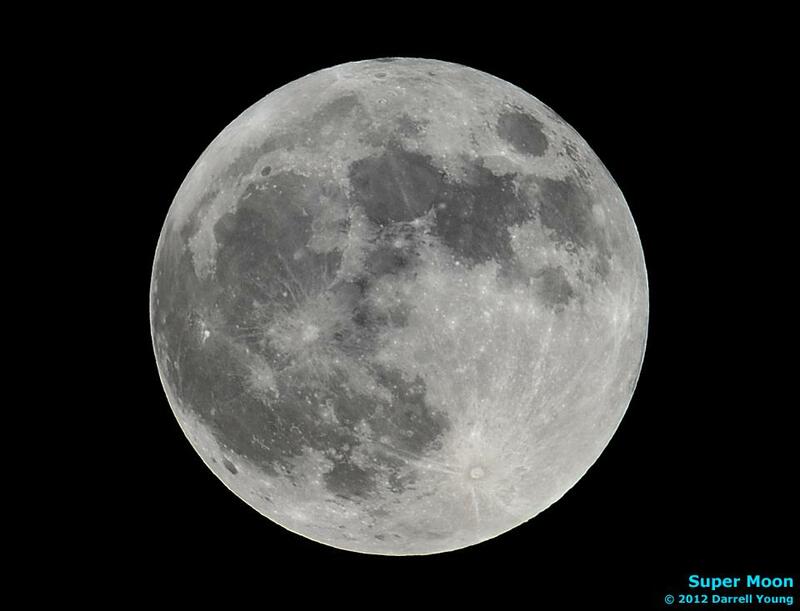 Therefore, use your longest focal length so that you can capture the moon well. Even a 400mm lens is barely enough to capture a reasonable moon size. Shoot the longest lens you have and crop. If you are having problems with autofocus racking in and out when you try to focus on the moon, please turn autofocus off with the switch on the side of your lens or front of your camera. Afterward, use the viewfinder or Live view mode to manually focus on the moon, trying to focus so that you can see the Moon’s craters and plains sharply. If you get close you will be okay, The very small apertures required to get a good exposure will provide enough depth of field (zone of sharp focus) to cover minor focusing errors. If you are worried, take a few pictures and go inside and look at them, or, at least, zoom in on the monitor of your camera. If you start early enough, you have time while taking moon shots. If you are using a tripod—which you should be—you may want to disable any vibration reduction (VR) your lens is using, especially for older lenses. If you are super critical about sharpness, it is good to use hands-off shutter release (cable release) and use the mirror up mode (MUP) to remove any unsharpness from mirror slap. Finally, it may be a good idea to shoot some pictures slightly underexposed and then lighten them a little in the computer. While that might add a little noise, it could let you capture some detail you might lose otherwise. Primarily, be careful about overexposing the moon and losing detail in the highlights. Shoot a lot of pictures and keep only the best! If you follow these simple steps, and experiment a little, you will capture some of the best moon shots you’ve ever taken. Darrell Young is an active member of the Nikonians User Community, Nikon Professional Services (NPS), Professional Photographers of America (PPA), North American Nature Photography Association (NANPA), and the author of 18 photography books from NikoniansPress and Picture and Pen Press, through Rocky Nook. You may review a few of Darrell’s books here. He has been an avid photographer since 1968 when his mother gave him a Brownie Hawkeye camera. Here is one of Darrell’s nature image portfolios. His website, www.PictureAndPen.com, was created to support the readers of his educational books, photography students, and clients. Visitors to his website will find articles and reviews designed to inform, teach, and help you enjoy your photographic journey. Thank you for such excellent info. We will try this tonight. Thank you Darrell. I have taken no moon shots for a very long time but I appreciate your professional advice and will put that into action when the opportunity presents. Skies over Dublin, Ireland are bleak at the moment at two hours before midnight. Wonderfully concise and simple post from my favorite Nikon author! Used my Nikon D7200 with 200-500 nikor lens. Isn’t the 200-500 a great lens? I love mine. Wow — I’ve tried to take photos of the moon before and never succeeded. Now I know why. Thank you for providing an easy-to-understanding tutorial!!! What is the true color of the Moon when the atmosphere has been stripped away. Isn’t the atmosphere in effect one huge lens filter? “Once in a Blue Moon”, during an eclipse the Moon will appear red, mostly whitish or looking like Swiss cheese, add a forest fire or factory belching pollutants and another color still. I ask again, what is the true color of the Moon? It formed nearly 5 billion years ago., when it was torn from the Earth by another heavenly body. At least in the human’s brain’s Visual Cortex, information received by cones cells in our eyes is processed and a “Color Constancy” is applied to help us recognize objects under almost any lighting conditions (color temperature). There is no thought and experience process in Camera Sensors. Photos are collected. So, if we assume the Moon was torn from the Earth, and discount the Sun’s reflected brilliance and the filtering of our atmosphere, would it not look like defoliated parts of the Earth? That would be my guess, having never personally stood on the surface of the Moon. I tend to use “Direct Sunlight” or 5,260 to 5,560˚Kelvin . . . and AUTO White Balance for comparison. Thanks for the advice. I took a few pics this evening with my Nikon D7100 and Nikkor 200-500 f/5.6. They turned out great! HI. Just beginning with my new D750. Began by reading your book, got to the page where you say you’ve written, “Initial Hardware Considerations” (for newbies to the digital SLR world) but cannot find it anywhere. Is ti still available? I understand, and use manual mode. Is not a sharp focus……I have even tried different WB settings. And suggestions would be appreciated. Would you come spend the day with me, teaching me and offer advice? You are one of the few persons I understand what you are saying regarding photography!! Thank you for your clear directions!! Thanks for the tips. It got worked !! « Pixel Problems in Your Nikon! Darrell Young is author of the Mastering the Nikon® DSLR series books, published by NikoniansPress and Rocky Nook, Inc. He is a professional photographer and writer living within a few miles of the Appalachian Mountains. Is Nikon’s Z 14-30mm F4 S Lens Worth US$1300? Nikon Announces the Nikkor Z 14-30mm F4 S Lens! Important DOF Preview Information for Nikon Z Cameras! Which Color Space Is Best for Nikon Users? The Nikon FTZ Adapter Cannot Fully Support AI and AI-S Lenses! Nikon Capture NX Color Control Points Are Back! The future of photography is mirrorless! Should I sharpen an image before or after noise reduction? Am I Worried About Nikon Z Camera(s) Single Card Slot? Nikon Z6 and Z7 Mirrorless Camera Revealed! Pixel Problems in Your Nikon! Do I Really Need a Polarizer Filter? Why Should I Shoot Vertical Pictures Often? Does Using a Cheap Filter Really Matter? Will a Nikon Autofocus at an Aperture of Less Than f/5.6? Which Pictures are the Most Important? You Make Pictures Not Your Camera! Who Wants a Nikon D810 Now?